Firefighters tackling the blaze at the psychiatric hospital. A fire killed 37 people in a Russian psychiatric hospital on Friday, the second deadly blaze at such a facility this year, heightening concerns about Russia's treatment of the mentally ill and other vulnerable wards of the state. Fires have frequently claimed high tolls among residents of hospitals, schools and other state institutions over the past decade, raising questions about safety standards. The pre-dawn fire razed a dilapidated ward for severely ill male patients at the hospital in a provincial village north of Moscow, apparently killing some while under sedation as fog slowed firefighters traveling from 45 kilometers away. Emergency and law enforcement authorities had recently sought to have the run-down wood, brick and concrete building condemned as unfit for use, a senior official said. Federal investigators began a criminal inquiry into suspected negligence. State television showed firefighters spraying water on the smoking, blackened ruins of the hospital ward. A female orderly died while trying to save patients at the hospital in the village of Luka, which is in Novgorod province between Moscow and St. Petersburg, the regional branch of the federal Investigative Committee said in a statement. Firefighters looking at the debris left after a fire destroyed a psychiatric hospital in the town of Luka on Friday. It said 37 people were killed, and the Emergency Situations Ministry said 34 bodies had been recovered by 10 p.m. Friday. "Psychiatric hospitals are the worst of all," said Yuri Savenko, president of the Independent Psychiatric Association of Russia. "Their condition is pathetic. It's inevitable that such things will occur increasingly often." More than 20 patients were evacuated after the fire broke out shortly before 3 a.m. The fire left little but the concrete foundation of the single-story building standing. Volunteer firefighters began battling the blaze minutes after it started, but the nearest fire station is 45 kilometers away and it took a crew 45 minutes to arrive on fog-shrouded roads, Interfax cited a top regional emergency official as saying. Investigators and the chief doctor at the hospital said they suspected a patient started the fire, Russian news agencies reported, but regional governor Sergei Mitin said it might have been accidental. "Medical personnel saw a patient who was shrouded in flames. … It's possible that he was smoking in bed and the mattress caught fire," Mitin said, Interfax reported. He said the ward that caught fire housed severely ill patients. "Sedatives were given to patients for whom they had been prescribed," said the chief doctor, Gusein Magomedov, Interfax reported. Emergency officials and prosecutors had sought to have the building condemned as unsafe, but a court instead ordered management to correct unspecified flaws by August 2014, the head of safety oversight for the emergencies ministry said. 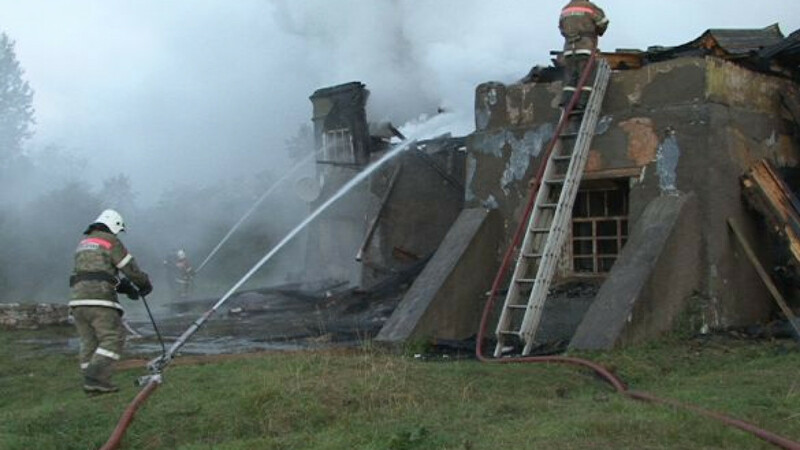 "The building that burned was unfit for use," said the official, Yury Deshevykh, Itar-Tass reported. A doctor said there had been plans to move the patients to a newly renovated building elsewhere in two years, RIA reported. Fires with high death tolls have struck state institutions including drug treatment centers, dormitories and homes for the disabled over the past decade. 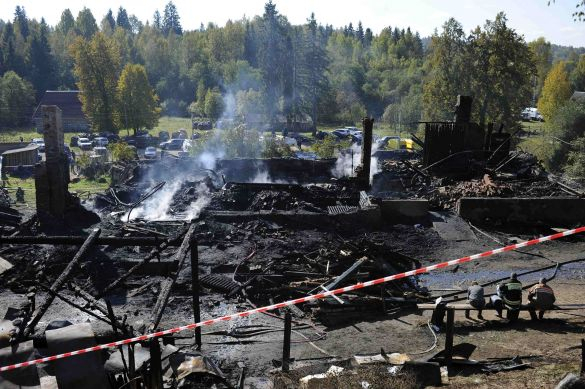 In April, a fire at a psychiatric hospital outside Moscow killed 38 people. Fires killed 11,635 people in Russia and caused more than 14 billion rubles ($430 million) in losses last year, according to the Emergency Situations Ministry. The death rate is much higher than in the U.S. and other Western countries.